↑ "Nicotiana rustica information from NPGS/GRIN". www.ars-grin.gov. สืบค้นเมื่อ 2008-03-17. 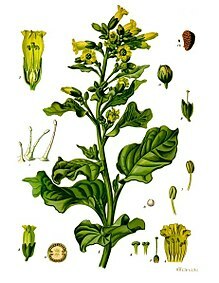 ↑ "Nicotiana sp". artsci.wustl.edu. สืบค้นเมื่อ 2008-03-17.